I believe that I've mentioned in the past that I was nearly twenty years old before I truly encountered Mexican cuisine. Before that, I had tacos, having learned to love them at the Jack in the Box fast food chain in my home town of Brentwood, NY. From that humble beginning, I slowly tested the waters, first with Taco Bell in Centereach (I went there with Sandra on a date; I was a big spender back then! ), and then some other chains. I admit that I was a bit naive when it came to Mexican food at that point in my life. All that I really knew about it was that it was hot. After all, there were many instances in cartoons where somebody would have Mexican food and then would get all red with smoke coming out the cartoon character's nose, ears, and other orifices. There were many jokes about Mexican food as well, like "Mexican weather report: Chile Today, Hot Tamale!" My first taste of Mexican food was at a chain restaurant called El Torito in South Miami. This restaurant was in a lovely outdoor mall called "The Falls." For a person that wasn't that familiar with the cuisine, I was immediately in food heaven. There were all these things that I've vaguely heard about before, but now they were right there in front of me on the menu: Tacos, enchiladas, burritos... you name it! Oh yeah... Margaritas as well! I frequented that restaurant quite a bit, although I didn't explore much beyond the typical tacos and enchilads (all beef, of course!). I also tried other Mexican restaurants, and being in Miami, most of them were pretty decent. 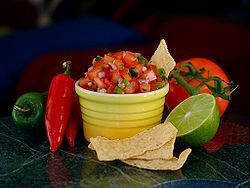 One thing common to nearly every Mexican restaurant I visited were the complimentary corn chips and salsa that were placed on the table, usually accompanied with "salsa," which is the local word for "sauce." The salsa was made with tomatoes, chiles, onions, cilantro, and other wonderful things. This simple starter became yet another reason I would fall in love with the Mexican cuisine. Chop up the tomatoes, both onions, and cilantro. Put almost half of the tomatoes into a blender with the lime juice, peppers, garlic, and rest of the spices. Blend until thick, but not watery. Add this mixture to the rest of the ingredients in a serving bowl. Put in the refrigerator for a few hours to allow the flavors to develop.